10-20 minute service that blends grey for a younger polished look, done conveniently and discreetly includes relaxing shampoo and conditioning rinse includes complimentary edge- out between cuts to keep you looking sharp. A camouflage treatment designed to cover grey hairs. The treatment takes 30 min and we match to the natural color of your hair. The treatment is very subtle, doesn’t completely cover greys but lessens the appearance of greys, and others will not notice that your hair has been colored. 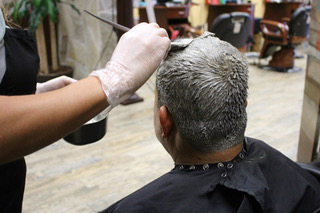 It is a semi-permanent color so it gradually fades over the course of 4-6 weeks after which we re-apply the color. Includes a relaxing shampoo and conditioning rinse as well as a complimentary edge- out between cuts to keep you looking sharp.